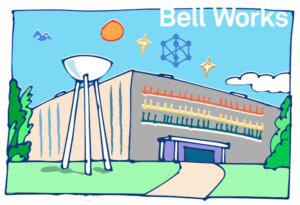 Formerly Bell Labs, this destination has been transformed. Constructed between 1959 and 1962, this complex was one of the final projects of Finnish-American architect Eero Saarinen before his death in 1961. Used as a research and development complex, it served the needs of the Bell Laboratories division of AT&T. Over 1 million square feet of office space, it now houses a Hotel, a Montessori School and a variety of stores and food franchises.